Passionate Realism Oil Paintings With Rich Detail, Lighting & Color. 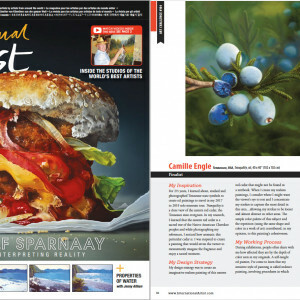 Welcome to the website of Camille Engel, an American contemporary realist oil painter, internationally acclaimed, and known for her use of rich colors, textures, and intricate detail. Accepted among some of the world’s top realists and into prestigious museum tours and art gallery exhibitions from California to Santa Fe to New York City, winning accolades along the way, Engel’s art career continues on a steady rise. 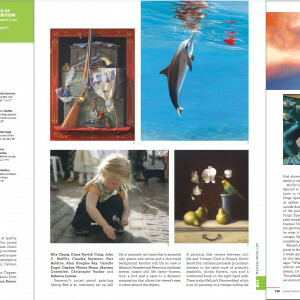 Each year her work is published and mentioned in national magazines like American Art Collector, Western Art Collector, The Artist’s Magazine, Southwest Art, the American Artist, Fine Art Connoisseur and Southern Living. Considered to be primarily a still life artist, Engel began her career by focusing her studies on floral paintings and still life paintings, and she loves to paint abstract views of realism. However, in 2007, her first bird painting, a Carolina wren titled, “Home Sweet Home” won the “Artist’s Choice Award” in the 2006 International Guild of Realism Exhibition — this created a new demand for her realism backyard bird paintings. Her bird painting depicting a Northern Cardinal titled, “Out on a Limb” won the People’s Choice award at Gilcrease Museum’s 2008 American Art in Miniature exhibition. And most recently, The Artist Magazine chose her painting of a Raven, “Strike A Pose,” as 2018 BEST WILDLIFE FINALIST. 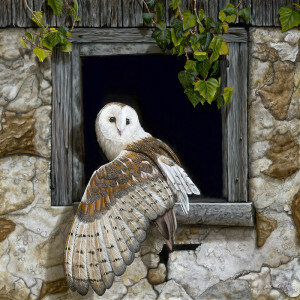 Camille Engel has become an accomplished contemporary bird artist. From her first bird painting in 2007 until 2017, Engel has won 20 prestigious awards for her bird paintings & 31 national and international awards for her oil paintings. We invite you to tour our bird paintings page where you will find paintings depicting a Bluebird, Goldfinch, Tufted Titmouse, Black-Capped Chickadee, Hummingbird, Western Tanager, Mockingbird and more. A well-commissioned artist, Engel’s work hangs in corporate, public and private collections such as the renowned Children’s Hospital at Vanderbilt, Nashville, TN; Northeast Georgia Medical Center, Gainesville, GA; The Baptist Hospital, Nashville, TN; Chattanoogan Hotel, Chattanooga, TN; and the Metropolitan Nashville Government, Nashville, TN. We invite you to tour the paintings inside: bird paintings, animal paintings, still life paintings, and abstract views of realism. Accepting both small and large scale commissions, Engel works with the highest quality oil paints on the highest quality archival support. Please discuss any questions you may have with the artist. To contact the artist about a commissioned oil painting, click here. Receive periodic news about Camille’s paintings, upcoming exhibitions and website additions.